Boogie Bunker Radio is a Worldwide online Station, and although we run on GMT, Through our night, we RePlay the best of the shows from the week, so you never miss a show, no matter where you are in the world. Each BBR presenter is featured 'Through the Night' and the schedule overnight reflects, or daytime schedule! So during the week, you will be able to catch up with your favourite shows. Each BBR presenter is featured ‘Through the Night’ and the schedule overnight reflects, or daytime schedule! So during the week, you will be able to catch up with your favourite shows. Biniroks is a DJ/aspiring producer with 16 years experience from Manchester,UK. Red Bill a DJ/Promoter with 6 years experience, from Le Tréport, France. 2014 -The first meeting at The Together Festival in Carmarthen, South Wales, UK, where Reelhousetv hosted the VIP arena. Growing up in London NW10 @ the height of UK Reggae Lovers Rock scene/Soul All-Nighters (music shops on every corner)!! I became a selector with a local sound system and never looked back. Enjoying a successful carer , buying and selling the music, " we all love to play " for over 20 years to various outlets/importers/classic record shops from around the world. Mondays 5-7pm(GMT) www.boogiebunkerradio.com & on 87.7FM in Tenerife. The Soulful Retreat my weekly radio slot on Boogie Bunker Radio. Each and every Sunday evening 8-10pm (GMT)is about sharing music with like minded people across the world in a variety of ways. To me music with soul is more than ‘soul music’ if a tune moves me, if a song inspires me or if it connects with me emotionally or physically thats what drives me musically. If I play it... can you sing it... I grew up listening to all types of music but it was Soul that really captured my spirit and has remained with me ever since. If you don’t know me yet love soul music then we already have something in common, my passion lies with Soul, Funk, R&B, Soulful house, and anything that moves me.... Better still anything that moves the crowd!! I am originally from New York spreading the sounds of the underground in Maryland. I have been a DJ since 1978. Growing up in New York, I heard the sounds of legendary DJs, Tee Scott, Larry Levan, Frankie Crocker, Shep Pettibone, Tony Humphries, Frankie Knuckles, David Morales, Louie Vega, John "Jellybean" Benitez and the late John Robinson. DJ from Santa Cruz, Tenerife, Originally from South America. This well Travelled Female, is one of the top DJ's on the Island of Tenerife. Residencies at Venues such as Bambu (Santa Cruz, Tenerife), show how highly rated this DJ is on the island. She debuted at Boogie Bunker Radio's Birthday bash, and was a firm Favourite at 'Fun in the Sun 2018' in Tenerife! Based in Herne Bay, Kent (UK). Music collector turned DJ Titch (Malcolm Davis). Is a well known face on the UK Soul Scene for many years, and well as venues around the Kent area, alongside Resident venues. 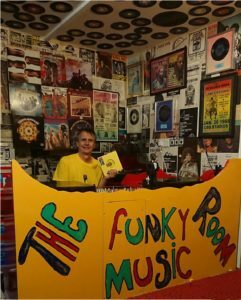 DJ Titch Debuted at 'Fun in the Sun' 2018 in Tenerife, for Boogie Bunker Radio. I'm a Dutch dj and I worked for (local) radio organisations, for instance for Brussels based Laid Back Radio (Julien of Laid Back gave me my nickname 'Professor' Eddy), and I recently played guest mixes on several radio shows and blogs, like Straightline on National Prison Radio, The Disco / Not Disco Show and AOR DISCO. My style can be described as intimate funky soul or ‘funky chill’. That's because it's funky music to chill on, or something like that ... In 2017 I reached one million plays on Mixcloud and I became #3 on the Mixcloud Best of 2017 Jazz, Funk & Soul chart: https://blog.mixcloud.com/2017/12/19/best-of-2017-jazz-funk-and-soul/ I hope you'll enjoy my mixes and visit my blog regularly for more music! This is my page on Mixcloud and you can follow me on Instagram, Twitter, Tumblrand Facebook as well. Oh, and there's also a Professor Eddy Soundcloud page. DJing the pub circuit around South East London in the early 90's. After a break of 18 years now back behind the Decks, to bring you the very best in Dance Music playing you House, Garage, Funk, Soul and all other aspects of Dance Music. If it was played in a Club it will be played on my show. Work in the Canary Islands: The summer 2015 he was the resident Dj in La Terrazza del Mare (Playa de las Américas, Tenerife). Other canarian clubs where he has played are Le Club, Café del Mar Playa de las Américas, Café del Mar Costa Adeje, Bahía Beach, El Rincón de Tin Tin, Bulan Chillout, Kook, Bounty, Magma, Room26, El Hombre Bala, Ébano, Voodoo Club, Club Art Café, Om Club Café, Cafeoteca, Moma Club Las Palmas, and many others. He’s played with djs like Anna Tur, Iban Mendoza, David Manso, Jose Hdez, Juan Fierro, Muse Groove, Quique Serra, etc. He has been the DJ of some resorts terraces like Sheraton La Caleta or H10 Gran Tinerfe Hotel, and the San Pablo Gourmet Market, etc. He has also performed at some festivals like Boreal (2009, Tenerife), Irvene Lan Party Showcase (2008 ,Gran Canaria), Fame (2005, Gran Canaria), CMAD (Tenerife, 2016), Despacio Museo Market (Tenerife, 2017), PWA World Cup 2017 (El Médano, Tenerife, 2017), Siam Nights (Siam Park, Tenerife, 2017), etc. Work out of Spain: He has played at The Aquarium (Lowestoft, UK), Le Colisée (Corsica, France) and in Belgium, where he lived for a year and took his artistic name. Macaronesia Podcast: He also works in his own project Macaronesia, a Deep House, Nu Disco & Indie Dance podcast. Every month he make a 1 hour session mix with some of the best newest releases. It’s sounded in different radio stations like Radio Ecco (Italy), KNDJ, Tenerife Music Radio, Xclusiv Sound Radio (Spain) or Apolonia (Algeria). Now, he make also a weekly version called Macaronesia Radio Edition. Music Productions: As music producer, he has releases on Beatport, Traxsource, Itunes, etc. with No Smoking Recordings, Crumpled Music, Miaudio or Maniana Records. He is also member of Spa in Disco Records. Good2Groove are a two DJ’s hailing from the North of `England'! They are Wayne Houghton and Scott Gilling (Gilly). Dj / Producer / Remixer. Yaniv Levy AKA "Disco Funk Spinner" Spins "Disco Funky House" ,Disco Groove, Disco, Boogie, Nu-Disco, Funk, Nu-Funk, Soul ,and House music in various hot-spots around Tel-Aviv. In Addition tho his DJ scene , Yaniv act as a producer. he specializes in digging old samples from the 50’s , 60’s, 70’s and 80's by giving them a new breath of life, sampled properly and remixed. Spanish DJ and music producer resident in Tenerife, Canary Islands. He has gained lot of experience in clubs, lounges and different festivals since his debut in 2000. Sala Tribeca (Oviedo), Maré Alta (Oporto), Matineè No Limit Festival (Gijón), Musicalia Deep & Lounge (Tenerife) Look Club (Viana do Castelo) Cafe del Mar (Tenerife) Bahía Beach (Tenerife) are among the places David Manso has work with. He’s shared booth with worldwide renowned DJ's such as Taito Tikaro, Juanjo Martin, Dario Nuñez, Yves Larock, David Herrero, Uner, etc… In the production field he works with Beachside Records from Miami, London based labels Slick Records and Prison Entertainment along with the Italian Cult Note and independent label Kalma Records. Nowadays he is bringing his Deep style to different lounges throughout Tenerife as Café del Mar or Bahía Beach. In 2014 he begins the project The Deep Room in HMX Radio with peers Jose Hdez. and Mickey Imperi and graphic designer Sergio Mistarak. The Deep Room consists of a portal weekly updated with the most important releases of Deep, Indie Dance and Nu Disco scenes. This up and coming project has been backed by numerous labels and producers.